Quasar is our new little star. It is a cat of classical German lines with a splendid pedigree. The proportions of his head and body are perfect. Quasar is a very elegant, high on legs and muscular cat. The green tone of his eyes is very intense and deep. His coat is soft, extremely dense and of a nice light blue colour. Besides his appealing appearance, Quasar has a special loving and outgoing personality. He enjoys cuddles very much, and when he is relaxed and playful he will drop down with his belly up, asking for more hugs. Quasar is smart, he learns new things quickly. He is a very neat cat, very easy to care for. 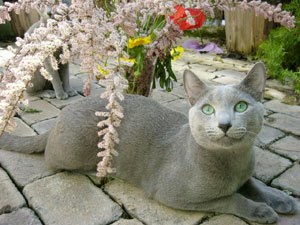 Dali is our russian blue dream. We were waiting for him for a long time, but it was worth it! It is a very elegant cat with a long, slender body. His coat is very silverly and of an excellent structure. 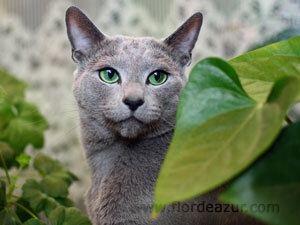 His expressive eyes have the unbelievable blue-based emerald colour. Dali has a nice profile, straight nose and firm chin. His tail is so long and plushy. Dali is quite vocal and likes to sing. He is a great player, and at the same time, a deep philosopher, who likes to observe everything from above. He is very well-bread - a real gentleman. It is a cat of the sweetest character ever and he just loves to be admired!